The Tasouken (蛇叢剣, lit. "snake cluster sword") is a sacred sword created by Yago Ametsukana and wielded by Adagumo no Yaorochi. It is frequently used in their spell cards and attacks and is a hidden final boss in Earthen Miraculous Sword. Its true identity is the legendary Sword of Kusanagi. Tasouken's species is "Sacred Treasure" and it has the ability to "sever relations". It has a title, called "Aloof Sword" (孤高の剣, Kokou no ken), and a music theme called "A Single Glimmer" (ただ一つの煌き). The kanji "蛇叢剣" appears in the Japanese title (鏈縁 蛇叢釼　～ Earthen Miraculous Sword). Tasouken is a long-bladed sword said to be a divine treasure, too powerful to be wielded by normal humans. Its form is very difficult for humans to hold. Even if someone uses tools and forcibly try to hold it, it won't exhibit its power, and in addition it may take off years of the user's life span. It's said that if there was someone who could know how to use it, that person would become strong enough to rule the world forever. It has the power to sever bonds and relationships and can mow down a thousand blades of grass with one stroke while engulfed in a blazing flame. Unfortunately, by now it's all rusted, so Yaorochi planned to restore it by transferring its essence to a clay model. Due to poor communication with the creator of the clay vessel, Yaorochi learned at the last minute that the clay model was actually a sword-shaped bottle opener. Yaorochi's sibling, Adagumo no Saragimaru, knows how to use it, but because they are distanced from Yaorochi, the details are not revealed. Centuries ago, there was a royal clan ruled by a certain powerful individual (implied to be Yamata no Orochi) that had control over several provinces of Ancient Japan. In the golden age of the clan they had a very important responsibility, which was a "sword" that was an heirloom given to them from Heaven, called the Tasouken. Of course other powerful clans and influential people were opposed to this clan, and aimed to eliminate the leader of the clan. However, there weren't many people in those days, who would go head-to-head against the leader of the clan in a sword fight, so the other clans threw a fake celebration for the leader, giving him unusually strong sake. When they were certain he was drunk, they murdered him, cutting his body into eight pieces, from where Yaorochi and Saragimaru were born. The heirloom was stolen and renamed as the Sword of Kusanagi. The Tasouken appears as a hidden final boss of Earthen Miraculous Sword. Sukune Katano was originally tricked by Adagumo no Yaorochi into transferring the essence of the Tasouken into a clay sword, but said process made the weather in Mugenri very cloudy. Still resenting humans for murdering Orochi's clan and separating them from their sword, they attack the heroes and use the battle to test the Tasouken. You'll fight the sword itself once you defeat its owner, Yaorochi, but the Tasouken attacks the heroes on its own because the essence of the Tasouken was too strong for the clay vessel. However, in order to battle this boss, you must have the "Cloud Flower Gauge" (雲花ゲージ) mechanic filled to at least 3 petals once you've defeated Yaorochi. Within this battle, you cannot shoot at it, nor can you use a bomb. 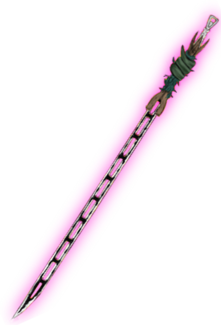 The sword only used one survival spell card, called "A Single Glimmer" (｢ただ一つの煌き｣). This battle is also synchronised with the music. The spell card has a series of patterns, and the last one requires you to graze danmaku and use the new gameplay mechanic "flash bomb" because there are 19 huge slashes that goes across the screen that cannot be dodged under normal circumstances. Luckily, the clay vessel was too much for the Tasouken and it stopped attacking. After Yaorochi and the sword were defeated, Sukune reveals to them that the back of the sword acts as a bottle opener. The orochi was devastated at first, but in the end they decided that they didn't mind at all because they had the sword in their possession after centuries, and it was all that mattered to them. ↑ JynX's Twitter: "To encounter the hidden boss, you'll need at least 3 petals~"
This page was last edited on 4 January 2019, at 06:01.